The Yorkshire Three Peaks Walk is a very demanding but rewarding walk, which takes in the summits of Pen-y-ghent (694 metres - 2,276 feet), Whernside (736 metres - 2,415 feet) and Ingleborough (723 metres 2,372 feet) all in one circular route. There is no set starting point, but the vast majority of walkers start at Horton in Ribblesdale, taking in the summits in the order shown above. The walk follows on from part 1 of the Three Peaks Walk (see separate text) which goes over Pen-y-ghent to arrive at the Ribblehead Viaduct. This second section as described here starts from the Ribblehead Viaduct and heads alongside the railway for just under two miles, before heading up Grain Ings and then across the stone flags to pull in alongside a wall that is then followed to Whernside's summit. The walk then continues by the wall, before dropping down to Bruntscar and along Philpin Lane to reach the B6255 about 50 yards from the Old Hill Inn. The Three Peaks Walk then follows part 3 (see separate text) over Ingleborough to arrive back at Horton in Ribblesdale. The route as described is the preferred route the Yorkshire Dales National Park Authority would prefer you to walk, so that the majority of the walk is on well maintained paths and helps prevent further erosion. 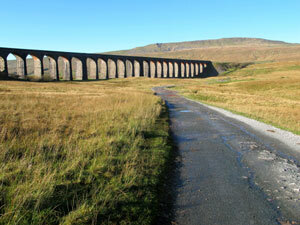 Parking: The second part of the Three Peaks Walk starts from the T-junction close to the Ribblehead viaduct. There is parking nearby for support vehicles (grid reference SD 765 792).